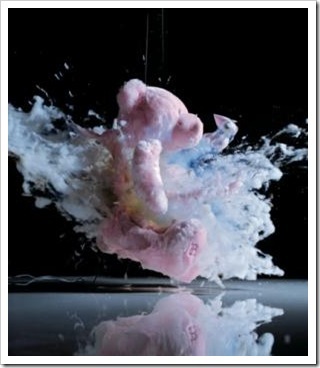 High-speed photography is an amazing thing. Milk splashes and rain drops, are the usual fare. This time someone has stepped over the line, and used their powers for evil instead of advertising; they shot a teddy bear. Kilimanjaro magazine Olu Odukoya founder says, “Seeing things exploding isn’t particularly rare, but seeing a teddy bear exploding evokes an emotional response.” Our response is: “Cool!” Especially once we had seen the “making of” video. Posted in: General Links, Links, Photography Sites.